Although it’s a bit fussy, I’ve always had a soft spot for the 1961 Cadillac and its “skegs”. But until I stumbled into this concept posted at Flickr by Glen H., I didn’t realize that these were originally conceived to end a lot sooner. needless to say, I can see why they got an extension. Here’s the familiar final result. Although Bill Mitchell clearly put his stamp on the ’61 cars, such as the loss of the wrap-around windshield and lower fins and a lot more surface on the sides, there’s also still a lot of Earl legacy in them too. This is most clearly reflected in the skegs on the ’61, which screams of Harley Earl’s 1958 Firebird III. That all changed for 1963, when Mitchell’s seminal Riviera and Grand Prix arrived. 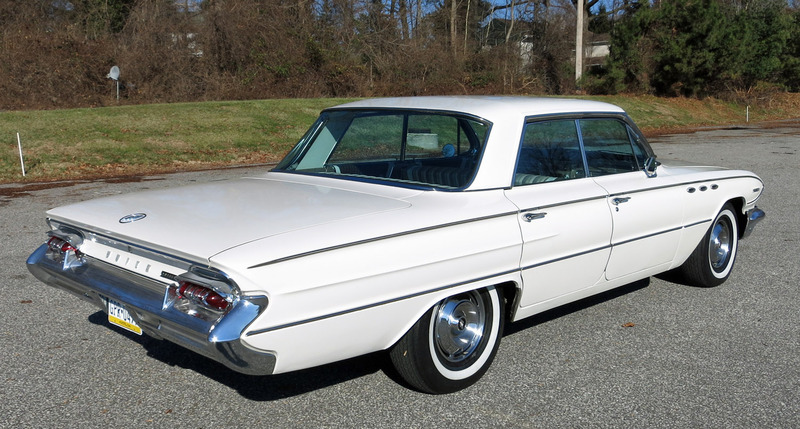 Their predominately slab sides and C-Pillar sail panels were indisputably influenced by the ’61 Continental, although the subtle crease that runs on their sides is also a notable and important difference. This can be verified by the fact that the earlier versions of the project, code named XP-715, had a very different look, essentially an evolution of the 1960 Corvair. It’s really kind of ironic: GM, commonly held as the design leader in the 50s and 60s, was being whipsawed by Chrysler, which resulted in the 1959 GM cars, and by Ford, starting with the Riviera. Wow ~ I too like the 61’s, glad those short skegs didn’t make the cut . 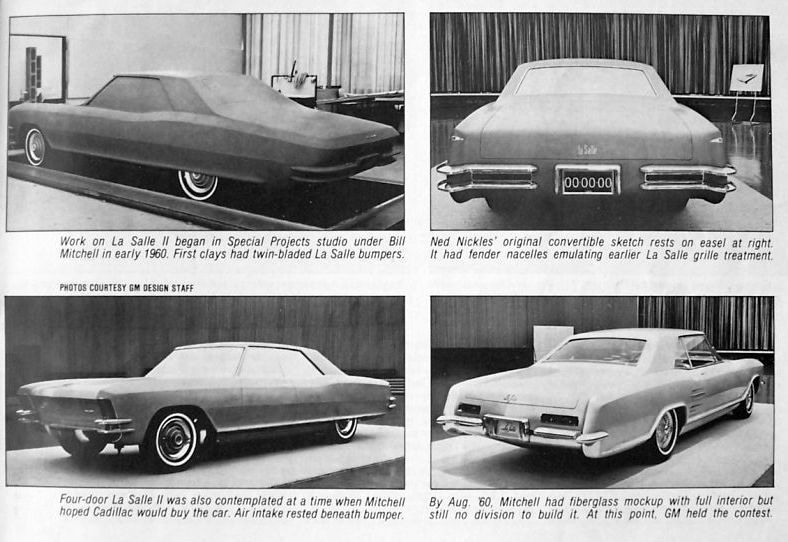 I guess it’s just me, but the Cadillac styling proposal looks like it might have influenced the designers of the 61-67 Thunderbird. Remove the songs entirely, change the roofline, and of course shorten it “slightly”. The production 61 Thunderbird looks very Ford to me, especially in the twin tube tail. That goes back to Ford show cars like Mystere. Joe Oros says that Ford was conscious of creating its own look that didn’t ape GM. 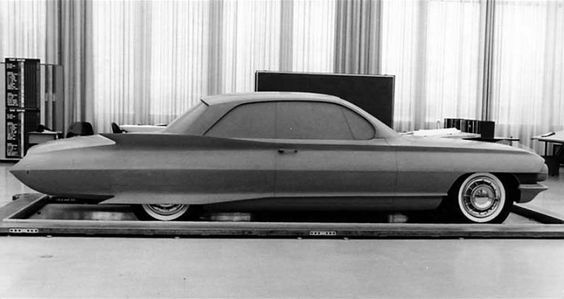 AFAIK, there weren’t Ford show cars the predicted the 61 Continental, which was proposed as a T bird. Especially in its coupe proposal form, the Continental suggests the Lancia Florida and other Pinin Farina designs of the late 50s. Regarding styling, everyone is looking at the designs of everyone else. Cross pollinations abound. 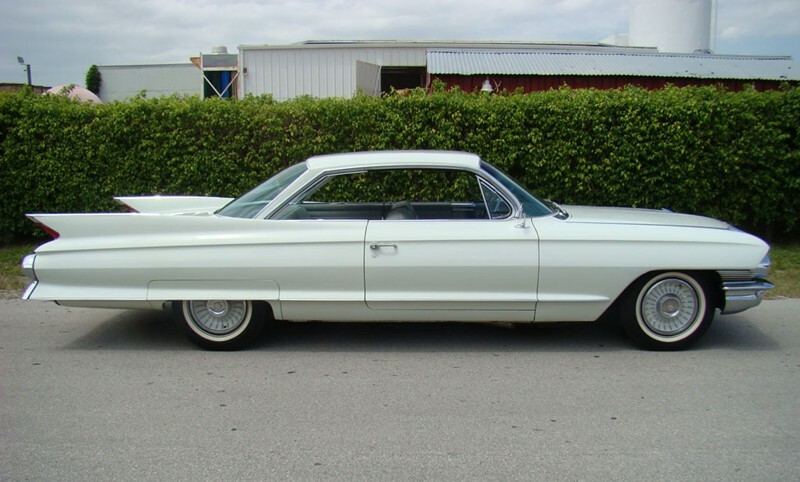 Skegs and creased low fins seemed to have migrated from the Cadillac design studios to the Ford Thunderbird designs of 1964-1965-1966 which have subtle skegs and subtle rear quarter crease-like fins–considerably toned down from the Cadillac proposals. More of the 1964-1966 Thunderbird crease like fins and skegs. 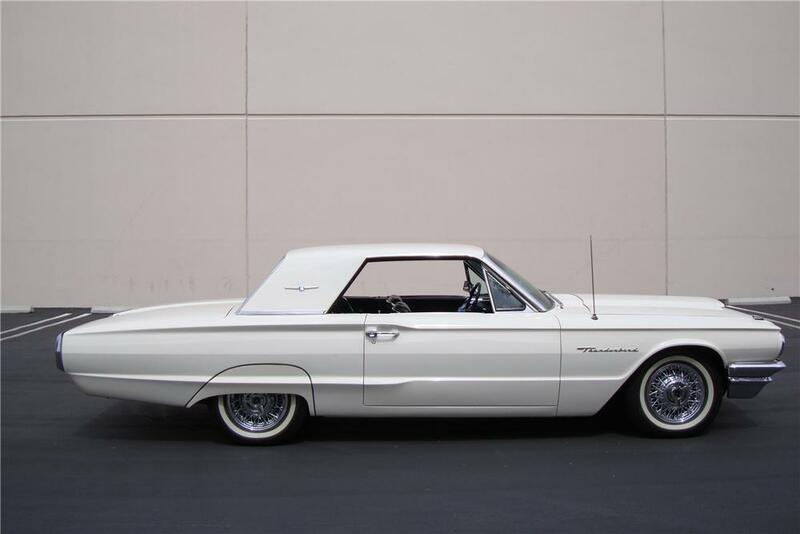 I have dreams about the ’64 T-Bird…daydreams and nightdreams. Just wondering: Are the skegs identical on the 1961 and ’62 models? I never could decide. Yes,mostly. Cadillac typically had a two year cycle for majorbody external sheet metal changes, except for the front ends and rear ends. The coupe roof was new on the ’62s, and the rear end fins are smaller, and the skegs at the rear appear to be very slightly smaller too, from the back of the rear fender skirts. The rear ends of the fenders and rear end itself have been delicately changed to look a bit different but still be compatible to the rest of the unchanged body. Damn. I have a hard time deciding which coupe roofline I like better. 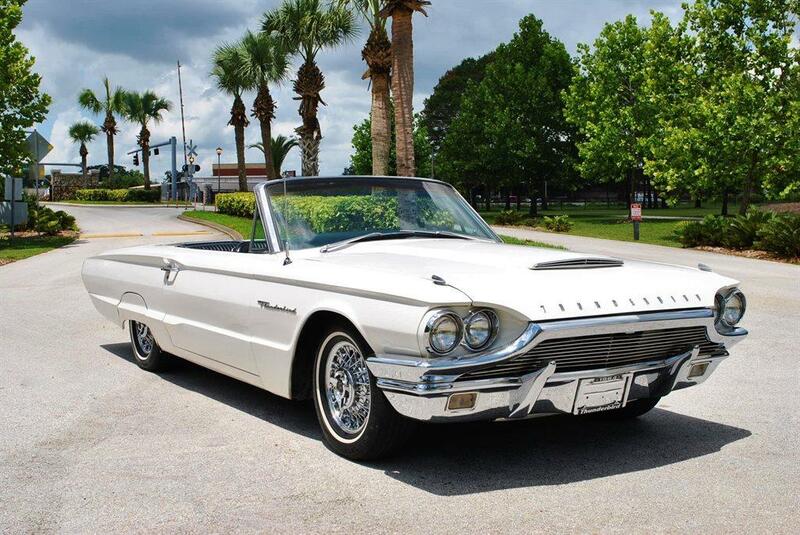 The ’62 is clean and elegant, but that ’61 roof is so open and airy. The ’62 is better. The heavier roofline gives it a more substantial look, more “presence” so to speak. Also, the fins aren’t as pointy. Completely agree. Strangely, the ’61 almost leaves me a little cold. The ’62, as subtle as the differences are, nails it for me, one of my favorite Cadillacs. I had both, a metallic light green ’61 Coupe deVille, and a Silver ’62 coupe, much preferred the ’61 visibility and lighter feeling. These were Cadillac, (and Buick Electra and Olds 98) version of the GM’s bubbletop, which started as an imitation of Chryslers thin pillar Hardtops, which I also preferred and owned. The ’61-’62 Cad’s did feel much the same, I also had convertibles fromeach year that felt near identical. Parked next to each other the 62 was one inch longer in the tail, I think from the tail light design. It’s interesting, in the convertibles I preferred the ’62. Wow, that clay model is one of the ugliest things I’ve ever seen! I can’t believe they went to the trouble of doing a 3D rendering — just drawing it would have been bad enough. Anybody got a rough idea of how many different clays GM typically did for their different car lines in the ’50s / ’60s? 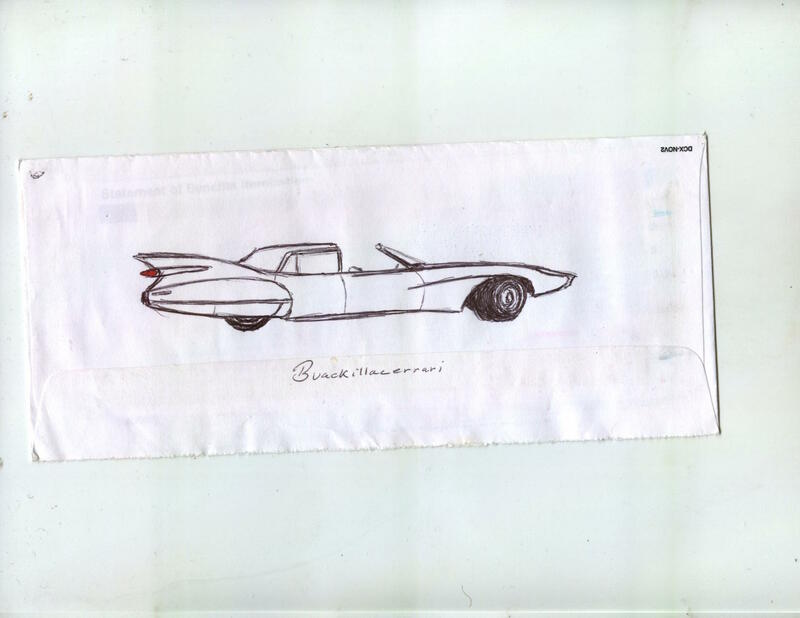 The studio development process was a long one, starting with far-out renderings and sketches, like the wildly unrealistic one below by Wayne Kady for a V16 Cadillac. As you can see, its distinctive tail eventually ended up on the production Seville some 13 years later. Ideas were constantly explored; some rejected totally, others shelved to be incorporated later, as part of a new design. Others moved more rapidly to production. It was a time when car design in the US was evolving rapidly, and the annual model change required constant development of new ideas and concepts. The whole process was undoubtedly quite different than for most European cars in the 50s and 60s, which did not have the luxury of so much playing around. Note that these short skegs were lifted almost directly from the 1958 Firebird III, whose picture I have now added to the post. 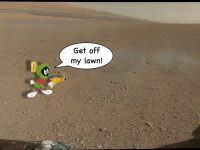 I’m sure Marvin The Pissed Off Martin (Warner Bros. cartoon character) would have loved the clay model, certainly it suited him . Sure. He’d read CC, too. Almost as if Exner had been told to design something with Cadillac themes. The difference is, Chrysler might have built the damn thing. I see what they were going for in that concept — by the 1960s jets were old news and rockets and space were the new cool thing. The whole side of that car looks exactly like a rocket. 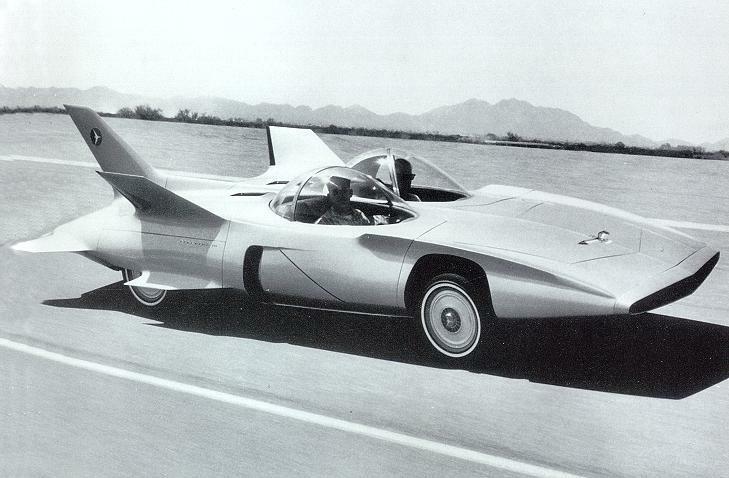 I need to add this 1958 Firebird III concept to the post. It’s where those skegs originate. This is a rocket if you’re still stuck in the ideal of ‘Buck Rogers’ serials from 1939, as GM Detroit was. Real rockets, missiles and space vehicles had already taken on a wholly different design ethos…. 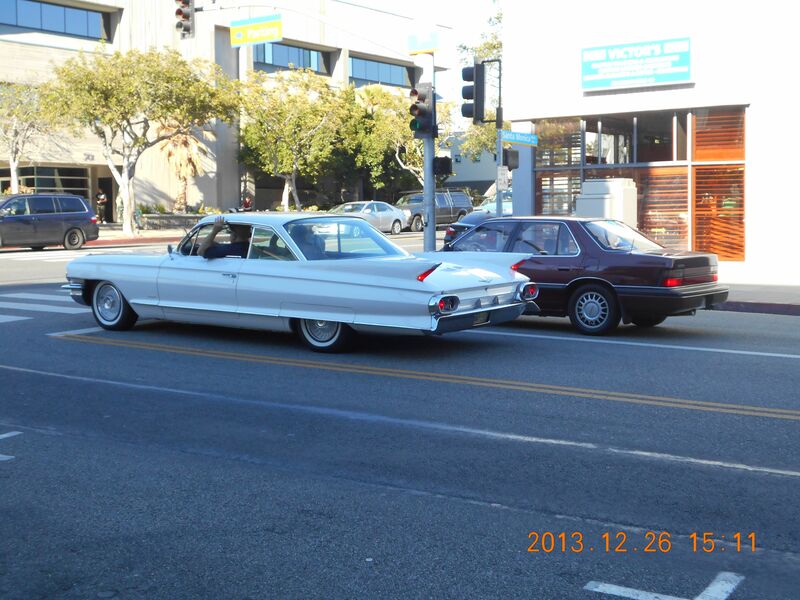 which is why that smooth fuselage of the ’61 Continental seemed so striking and modern. A wildly improbable design, that I loved on first sight. I always referred to it affectionately as the Catfish. I took automotive art and design classes in school, I loved the freedom of total design not set to others visions, this design was done in the last 15 minutes of class one day, I couldn’t think of a new design. 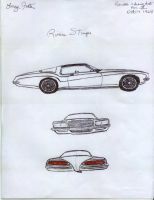 Mr Randall the instructor said “You’ve been looking at the new (1964) Riviera’s, take it’s style to what you consider the ultimate, and have fun with it.” I streamlined it, did a more European front end, and ended the boat tail (a recurring favorite design with me) with a wicked little stinger. I was floored when I saw the first ’71 Riviera Boat tail, my first thought, My God, someone built it. 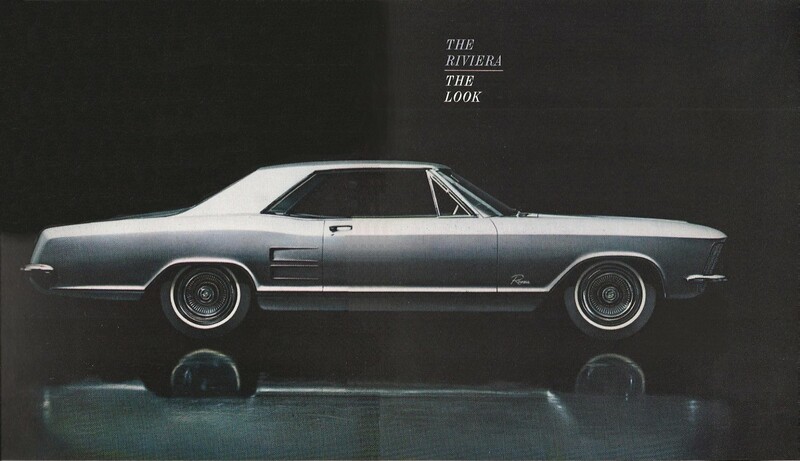 I disagree with the Early Riviera’s being linked to the Lincoln style, which I thought was brilliant, and had a bunch of those. i believe Bill Mitchells account of where he got the idea for the style. He had seen a Rolls or Bentley (personally believe a Bentley Continental coupe (so maybe Contiental style, just a different Continental), although the 4 doors had the same style) in heavy fog but saw the sculpted sides and that particular car had the razor edge roof which the first three years of Riv had. Check it on Google, 1955-1965 Bentley coupe was what I entered. The curvature of the sides is the same, the lower trim in place, the upper fenders Razor edge is there, the raised center of the hood, the entire proportions of the car. On the front, since it originally was to join Cadillac as a LaSalle II, on the front enlarge the parking lights of the Bentley to represent LaSalle 1940 grilles, then put a grille in with a touch of mid fifties Cad’s, and do simple tail lights in a clean rear. Even the interior console looks much the same. One Bentley called the Bengal looked like a cross between a ’56 Rambler, a Silver Shadow, and a ’64 Riv front end. Several later Bentley’s looked like early Riviera’s, the style seemed to go back and forth. I had several of each year ’61 and ’62 Cadillacs including a limo of each, as you may know, the skeg fins presented more work for the limo craftsman. Since the doors of all 75 sedans and Imperial limo’s were the same from model year 1960 through the 65s, the skeg fins were a bolt on except for rear fenders, also the front and rear fenders were unique on the 2 limo styles, to match the door contours, you may notice the upper body crease stops at the doors, the roof and glass used all those years was the ’59-’60 roof with that front pillar. I think the only stock sheet metal, may have been the hood, but it may have been unique also. 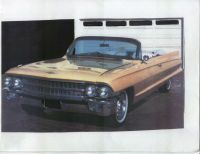 All the ’61-’62 Cadillacs I had were capable performers. I had my ’62 Cad convert before my Electra, and every weekend either alone or with norm bill and dan went to the flower power days of San Francisco, since it felt like a center to our universe at the time.That Cad came to a bad end one night when I decided to jump a hill. too much speed, could see into third floor apartments. It’s in my e book at Barnes and Noble “The Flying Cadillac” $2.98 so it can be picked up easily, It has many other true driving tales printed in Mopar, Buick, and other club magazines. I did manage to drive the totaled Cadillac 300 miles back home, down to 15 miles per hour at the last. I got my ’61 Cadillac convert right after, dubbed it the “Grey Ghost” because it was the only car I never put glass packs on. One car that was of course heavily related to the ’61 Lincoln were te 1964-1966 Imperials, can’t tell you how many times my ;66 black Imp has had calls of “Great Kennedy Lincoln,man” I had years of Lincolns and Imperials, the Lincolns were truly terrifying at any speed on a corner, went through many hedges, then, 66 and later, the front wheel under load could tuck under and snap off, the Imperials handle magnificently and are more comfortable long distance. This one reminded me a friend several years ago asked if I could combine some of his favorite cars for his birthday card. I sketched this, before redoing it into a card. Combo of ’59 Cad, ’48 Buick, Packard town car, and Ferrari, a Buackallacerarri. Friends often challenged combinations, they were usually interesting. And my ’64 Riviera which evokes Bentley style to me.This car was wrecked when Purchased, smashed full llength on both sides and rear ended I cat it apart, hammered it out and put it back together, painting it in the original Cloud Metallic Silver. That “full rocket” look from the side must have been irresistible at the time. Good one. That one was off my…rocket radar. My thoughts on both of these early concepts is that it’s like the designers were told to make the cars look more like rockets, and they took the instructions a little too literally. But maybe that’s a little too harsh. 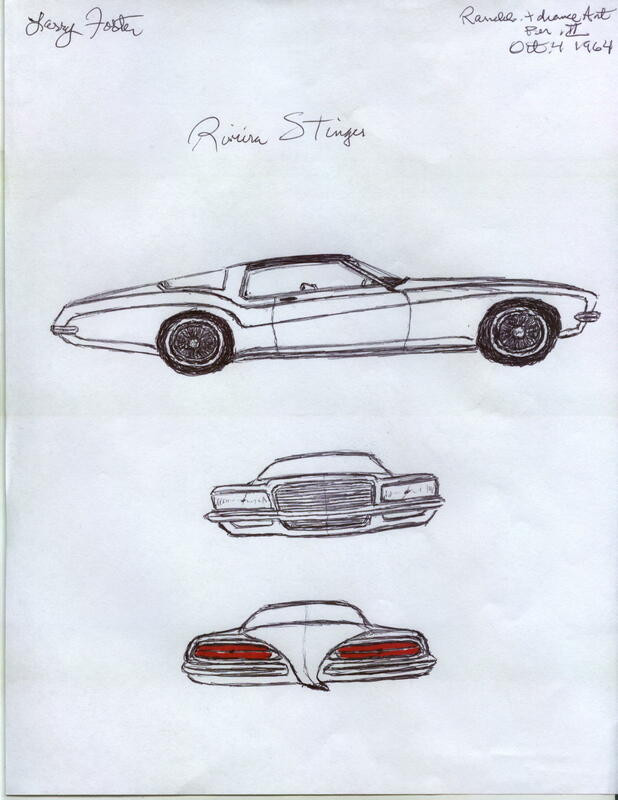 These early designs can essentially be considered a rough draft. They tried out the “full-rocket” look on a clay model, realized it didn’t quite work on a car, and went back and reworked the design to extend the skegs (I just learned that word today) all the way to the back. That adds some continuity with the earlier tailfin look while still maintaining a hint of rocket. JP, like I said, cross pollination of design ideas is always in the air. 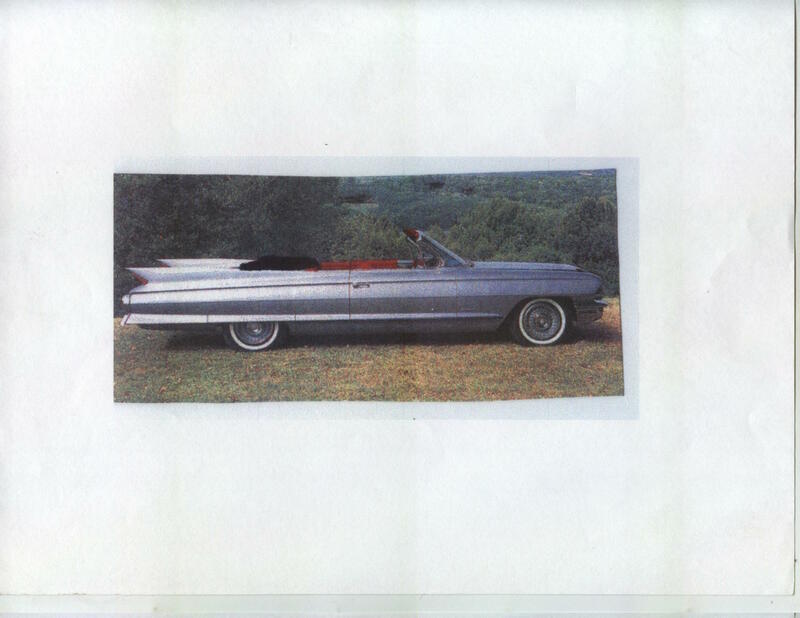 Did the Samsen proposal for for the 1960 or 1961 DeSoto rear, minus the huge skegs/fins, somehow find a way to blossom and bloom in the Buick studio resulting in a variant inspiration for the rear of the 1961 Buicks? Designers don’t live in vacuums or isolation. Ah, or is this just another CC speculation about design similarities? There’s “cross-pollination” and there’s “sea change”. Certain cars create the latter. That’s what I was getting at in this post. Cross-pollination was rampant and constant. Sea changes happened much less frequently. Possibly the beginnings of the weird fins on the ’60-’61 Dodges? ’61 Dodge styling is great if you like giant squid styling, which I think is very sleek, just don’t want to cuddle. I never liked the ’61 DeSoto front end and was totally shocked to see ’59 Lincoln prototype front ends and see EXACTLY the same split level grille. One 60’s Thunderbird prototype looked so much like a Toronado you could have sold it at an Olds dealer. Just thought of an incident at a concours several years ago. I had my black 66 Imperial on display when two women in their 80’s walked around the car which displays several eagle emblems. As they walked away, I heard one say, “That’s the biggest damn Thunderbird I ever saw”. Beat me to it, and I was just guessing. That really is a sign of how much GM was scared by the Exner era until it was apparent that Exner 2.0 was a complete dead end. That clay looks like something V. Exner might have dreamed up if he were working at GM rather than Chrysler in 1960/61. Those shorty fins are conceptually like those on Dodges from the same period. Oh, and it looks hideous – glad they decided to extend the fins and skegs all the way to the back. I do like that XP-715 prototype though; I see alot of 1965 Corvair in it as well as 1960 (look at those hips), with a hint of C2 Corvette in the front fenders. 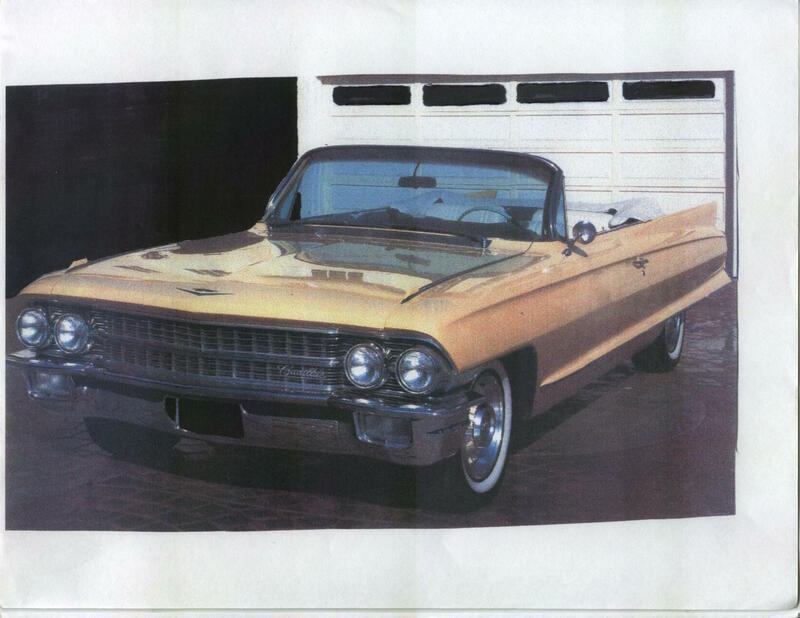 How could Mitchell work influence from the ’61 Lincoln into the ’61 Cadillac? Did GM have enough early glances of what was going on in the Ford design studios, with enough advance notice time to get a similar look into the production ’61s? I didn’t say it did. In fact, I quite clearly said the opposite. 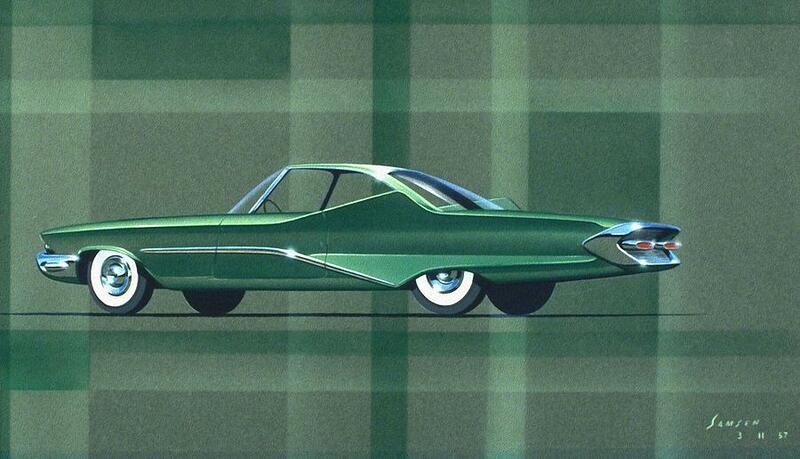 I said the ’61 Caddy was obviously a relic of the Harley Earl era. 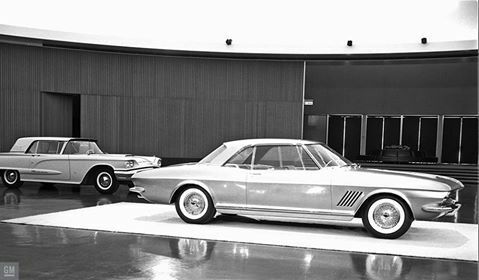 What I said was that the ’63 Riviera was influenced by the ’61 Conti. I apologize if I misread your intent, but that does read to me as if the ’61s (and you hadn’t yet brought up the ’63 Riv) were influenced by the ’61 Conti. My apologies, actually. I was sure that I had taken that line out after I wrote the next couple of lines. It’s a mangled sentence. And wasn’t meant to be there. I’m not even sure now what I was trying to say. I often jump around and keep changing things as I put these together. Thanks…. I *am* trying to be respectful here. Anyway, despite the obvious holdover of some Harley Earl design cues, to my eyes the ’61 looks like a pure Mitchell design even though he’s obviously trying to maintain some continuity with earlier Earl-era Cadillacs. Thus it has smaller but still pretty huge tailfins and that hint of a wraparound windshield at the base of the A pillar (which had already been used on the ’59 Eldorado Brougham and ’60 Corvair, and which Earl is on record liking even if it was Mitchell’s idea IIRC to use it in place of Earl’s favored reverse A pillar fishbowl windscreens). 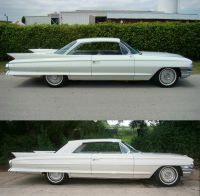 I have to think the ’61 Caddy would have been further toned down if it were a new model and not intended to be a successor to the previous year’s car, but I think Cadillac (and Mitchell) chose the best course for the ’61s rather than, say, chopping off the fins entirely like Chrysler did in 1962. 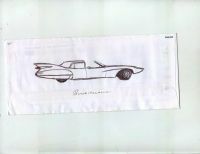 The new roof on the ’62 coupes does look to be influenced by the Continental and T-Bird. I’m not implying that Mitchell didn’t oversee the ’61 and put his stamp on it. He clearly did, in a number of ways. But the skegs and fins are still showing quite a bit of Harley Earl influence, although the need to maintain continuity was undoubtedly important. The point I was *really* trying to make (and din’t succeed) is that Mitchell’s first really new cars were the ’63 Riviera, GP and Sting Ray, and the Riviera and GP have a lot of ’61 Conti influence. And from that point forward, Mitchell’s work continued that direction that was set for 1963; most everything was an evolution of that look. The ’61-’62 era was a transition for him. Although there’s a really strong resemblance between the Riv and the ’62 Chevy II, particularly in the shape of the fenders in section. It’s a testimony to Mitchell’s skill and GM’s power that they got away with doing that on the cheap car first. I’m, broadly speaking, not a fan of the excesses of the late 1950s. This concept, though, is so over the top and uses symmetry so well… I can’t help but be mesmerized by it. That clay at the top of the article hurts my eyes. Everything aft of the fins and skegs looks wrong. But what if this car’s body had ended where its fins and skegs did? See my crop below for a crude idea. It has rather nice long hood / short deck proportions. Then the fins and skegs work pretty well to my eye. What if Cadillac had built a personal car like this? Or in another world, would a ’61 Mustang have fins? Ford had canted fins on the late 60 Comet and the 62 Fairlane so a new 61 Mustang might have had fins too. Love the ’61! The skegs balance the drama above quite nicely. Predominately horizontal themes aligning with the ground plane and intended direction of travel. A rocket without the flame (surfacing). To me this is a real Cadillac- readily identifiable, relatively restrained, quality materials, well built. Something I’d like to own if I had the corresponding lifestyle. Those short skegs are just begging to be carved off from the clay – that’s quite a neat design without them. I loved the 61 Cadillac when it came out and still do today. 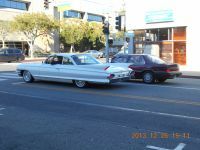 I caught this stunning example in traffic in downtown Santa Monica a few years back. As someone who did not like Cadillac styling from 58-60, the 61-62 models were a huge breath of fresh air. Thanks for this history. That look is why I prefer the ’61 coupe. I love L.A. ! . 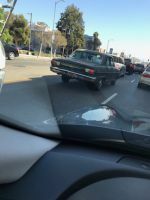 +1 Nate – Here’s a pic of an original Chevy II I got recently while traveling down Vermont Ave. – esp for you. It has the 283. A ’65 maybe ? . 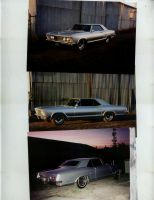 I had ’63 Chevy II’s back in the 1970’s when no one cared, even two RPO 741 SS’s . I know they’re wretchedly cheap but I loved them just the same . I see lots of oldies wheezing about Los Angeles (one more thing I like about the Ghetto/Barrio) and occasionally snap pix but so far CC and TTAC doesn’t want my pix . Some even have the paper thin cheapo original hub caps =8-) (inster heart here) . but so far CC and TTAC doesn’t want my pix . I seem to remember using one of your finds at a gas station. If you post your shots at the CC Cohort and they grab my attention, they will be used. That’s how it’s done here. I’m not sure what Cohort is, not sure I want to join yet another site . CC Cohort is part of this site, Nate. If you scroll to the top of this page, you will see a row of links starting with “Home”. The fifth link is “CC Cohort”. There are tons of photos of all types of cars posted there. I’m sure Paul or someone else can explain how to post there, I never have. I enjoy looking at the variety of car pics posted there, I’m sure you and other CC readers will/do as well. There is no commentary/articles there, just pics. A great place to go when you are up-to-date on reading posts! Rod has beat me to it. It’s a dedicated Flickr page. Flickr is a free photo sharing site. You do have to sign up for a Flickr account, and then join the CC Cohort group to have your photos show up at the Cohort. Thanx Rod / Paul ! . This is why Viagra was invented. Sometimes, your skeg just isn’t what you want it to be, and with some help it can be all that you want it to be. I’d love to see the date on the short-skeg clay. Because the ’61 design was so heavily predicted by the ’60 Eldorado Brougham. It would be odd if they were still trying wild and crazy things like that after the ’60 Eldo Brougham design had been locked in. 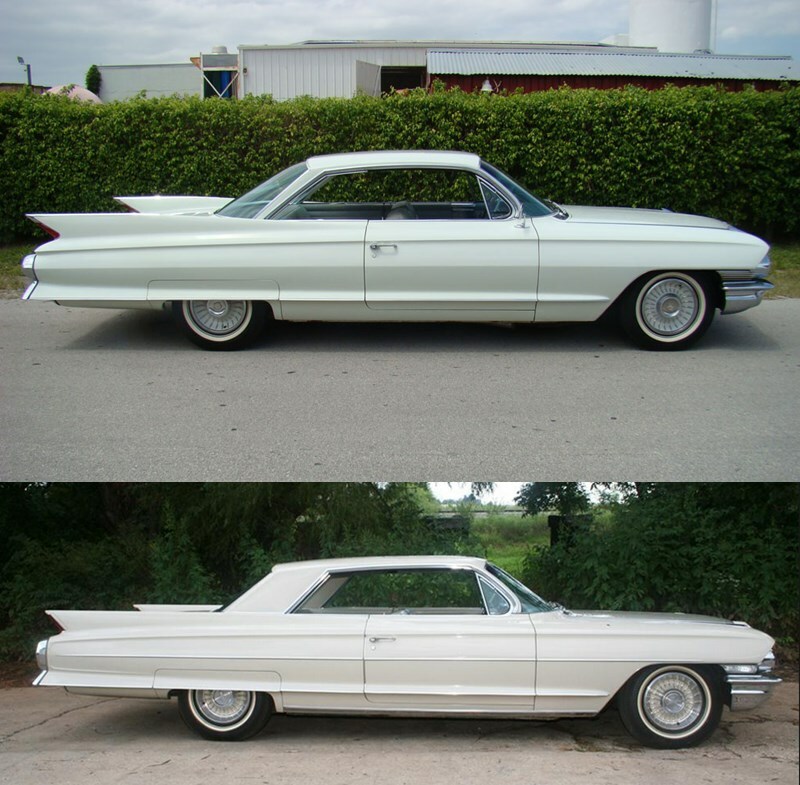 The Eldorado Broughams had the luxury of knowing the locked in design before being built so the ’59 could predict the ’60 and the ’60 the ’61. Because of the virtual hand build on these they didn’t need the ramp up to production of assembly line cars. I recall reading about the development of the ‘61-‘64 Oldsmobiles. The first thing Mitchell said was get rid of those name damn skegs for the ‘62 Model. A lot of Harley Earl lived on in the 1961 GMs and the ‘A’ pillar of the 1962’s. I like Buicks better than Cadillac, but when I bought most of my ’61 and ’62’s I didn’t realize that yet.I did have a hell of a lot of fun with these cars. Ever four wheel drift a 75 limo on a winding road? What a trip. Amazing thing is they did it so damn well. I would suggest not doing 180’s with the 75 limo though, the convert did it great, the limo I broke all four steel rims. No disrespect to Paul Niedermeyer, I simply disagree with the ’61 Continental and ’63 Riviera connection. If you follow the style of the ’55 and up Bentley’s they are just too close in style to disbelieve Mr. Mitchell’s tale of the car in the fog that sparked his creation of the Riv. If you ever have a ’61-’62, do not accelerate from a parallel parking space rapidly, the skeg fin and bumper can bottom on the curb. also the suspension was all mounted in rubber on these, one day I was pulling up to Norm’s quickly, when he suddenly decided to pull out of the garage in his ’57 Buick. I hit the brakes hard and the Cad stopped in short distance, but Norm looked strait down his outside door and said “How’d you do that, your Caddy is back almost two inches, but there’s a perfect impression of your front bumper in my door” That was when we realized all that rubber let the car move that far on it’s suspension, and spring back. This was printed in the SIA magazine ’63 Riviera DriveReport feature years ago. Study the surface development on the sides, it’s clear the ’60 Eldorado Brougham was the linear predecessor of the Riviera. Tailored, subtle creases, skeg fins that lost their pointed ends, it was a great departure point for a stellar design. Picture in your mind the lower left clay with center-opening doors with the rear styling in the upper right: the next generation Eldorado Brougham! You can sure see the ’65+ Pontiac Grand Prix in the pix above. Interesting to see the Riv..ah..LaSalle II with skirts. I don’t understand such distain for this mock-up. A great many mock ups looked far from perfect. You have to understand the creative process involved in 3 dimensional sculpting. Things can look a certain way on paper, but it’s a while different thing to be able to walk around a 3-d representation. And just as importantly to be able to study photos of a vehicle from all angles. Given the way the mind works, photos of a car are eually important to study. Is this mockup any uglier than anything from “Detroit” now? To me, no. That Godly front half with those Eldo wheel covers give it enough elegance to surpass whatever modern US car is in these nay-sayer’s driveways. Ian A Williams on QOTD: Would You Buy A Diesel? Kmcbride on MM-QOTD: We’re Time Traveling Back to the 1980s; Which Big American Car Will Be Your Daily Driver? GOM on Bus Stop Cinema: UK Bus Company Training Video – How’d You Score?